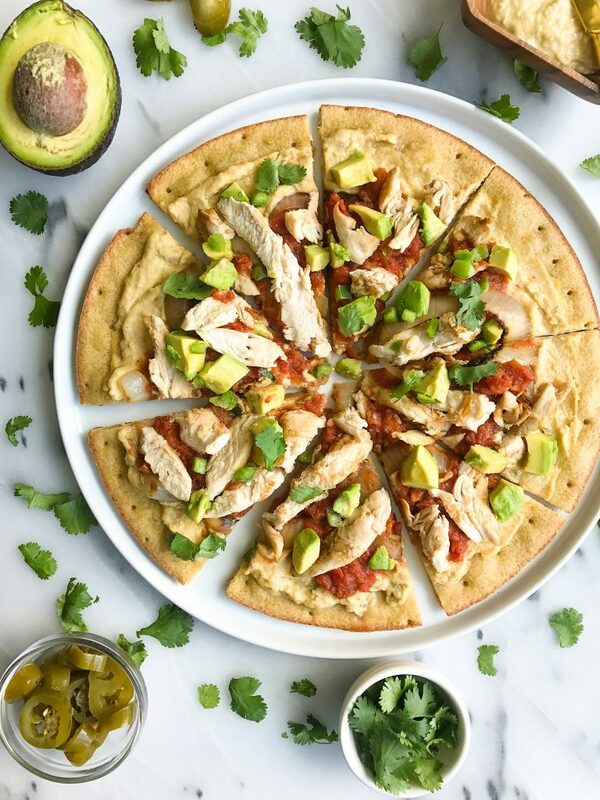 My Favorite Grilled Taco Pizza with Shredded Chicken for a delicious dairy-free pizza recipe! Being that we are from New York, it is no shock that J and I crave a good slice of pizza on the reg. When I lived in Florence too, it was always my go-to food when we were out for dinner. I’m not much of a pasta gal but cannot resist pizza. especially the gourmet kind with cool toppings, fancy crust and basically the kinds that don’t include tomato sauce, cheese or your traditional ingredients. I am more into goat cheese, arugula, veggies and chicken with a mean balsamic glaze on top, YUM. And now that summer is here, chances of me wanting to put my oven on everyday are like zero. Instead we have been making grilled pizza. Or in our case “stove top pizza” since we don’t have a grill (city problems). 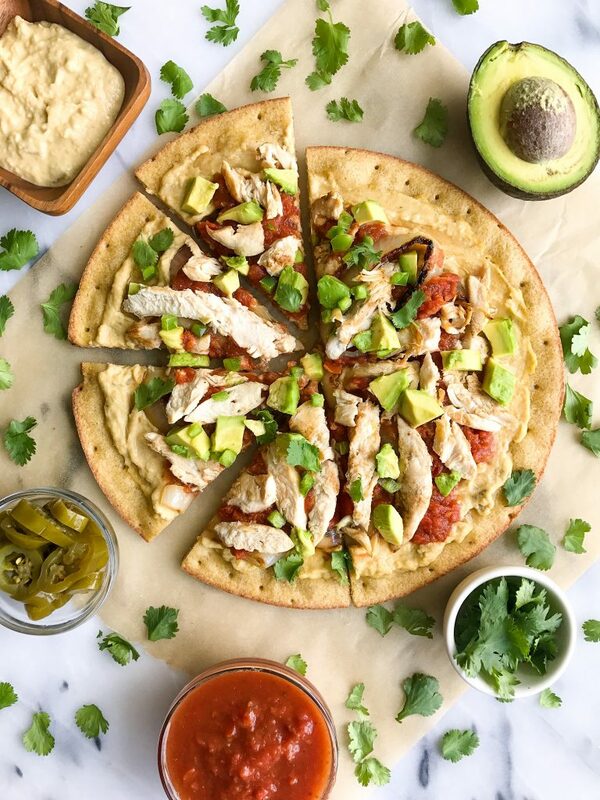 This Grilled Taco Pizza with Shredded Chicken is such a unique spin two of our favorites (tacos + pizza) in one easy and delicious recipe.You may notice there is no cheese on the pizza but I promise you won’t even notice And if you do, add some up top if you’d like. 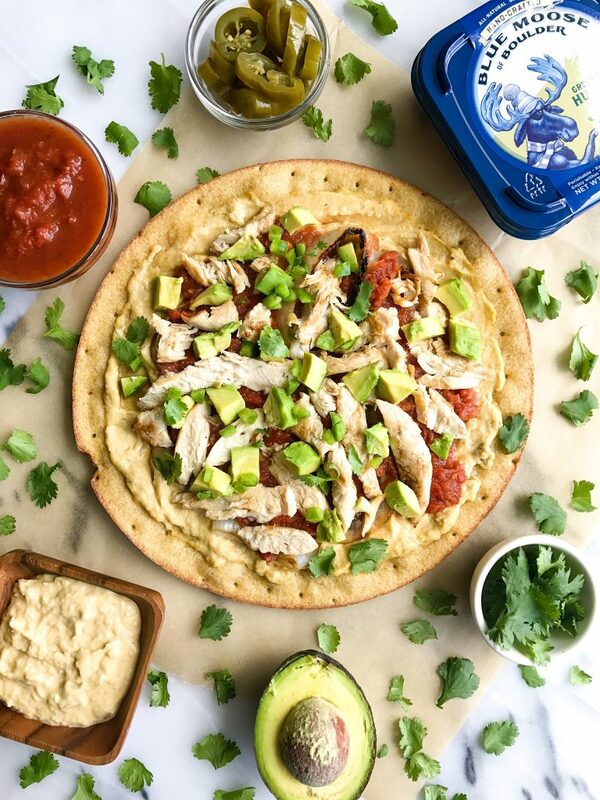 This pizza is layer with Blue Moose of Boulder Green Chile Hummus, Blue Moose of Boulder Medium Salsa, avocado, cilantro and my favorite shredded chicken! Blue Moose of Boulder is a new friend of mine (yes I am referring to a product as a friend) and I am seriously into their hummus. Especially the original, pine nut and green chile. It is so creamy and flavorful and you may find me spooning it as I am cooking dinner at night. It is also a cold pressure product aka high pressure processing product. Cold pressure works to keep products extra fresh and protect them from any bacteria. This is used instead of preservatives or high heat to keep products fresh. When you get any of their products, they are flavorful, fresh and nutrients are still there. Blue Moose of Boulder products are served in a variety of stories but they also are on Amazon Fresh. They sell salsas, hummus, pesto and even these little snack packs. You’ll notice I use the hummus in place of tomato sauce on this pizza. The shredded chicken on top is from POACHED chicken so it is extra soft and truly my favorite way to prep chicken. It makes it so much easier as a pizza topping too. Feel free to grill this pizza, cook on stove top or even if you do want to use the oven, it’ll work! Add avocado and cilantro on top, slice and enjoy! Thank you Blue Moose of Boulder for sponsoring this post. It means so much to me to work with brands that I love and who support rachLmansfield!